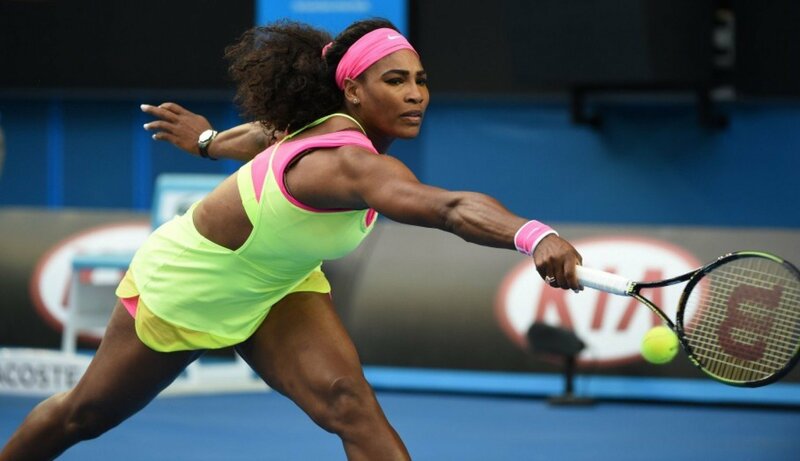 World number one Serena Williams beat Maria Sharapova to win her sixth Australian Open and 19th Grand Slam title. Serena Williams, 33, served to win a pulsating final 6-3 7-6 (7-5) after Maria Sharapova fought back in the second set. The American moves past Martina Navratilova and Chris Evert with a 19th major singles title. Serena Williams has now beaten Maria Sharapova, the world number two, 16 times in a row dating back to 2004. “I have to congratulate Maria, she played a wonderful match and she really pushed me,” said Serena Williams. Despite feeling so unwell during a rain delay in the first set that she left the court to vomit, Serena Williams hit 18 aces and 38 winners as she won in one hour and 51 minutes. Seemingly unsure for a moment that an ace had sealed victory, she then shook hands with Maria Sharapova and bounded over to the corner of Rod Laver Arena towards her player box. It was a brilliant performance in a final that exceeded many expectations, bearing in mind the players’ head-to-head record. Maria Sharapova made a nervous start, double-faulting to drop serve in game one, while Serena Williams appeared keener than ever to shorten the points, possibly because of her ailment. The American crushed the Russian’s second serve and was not disrupted by a 12-minute rain break that led to the roof being closed. Still feeling the effects of a heavy cold that has dogged her over the last week, Serena Williams headed off court – in contrast to Maria Sharapova – but the top seed returned at the potentially dangerous score of 3-2, 30-30, to calmly produce an ace and a forehand winner. Breaks of serve were swapped before Serena Williams took the set in 47 minutes with a backhand and a scream. Maria Sharapova was looking at another one-sided defeat when facing break points early in the second, but showed why she is a five-time Grand Slam champion. She served her way out of trouble and managed to cling on in a set in which Serena Williams hit 15 aces and won almost 90% of first-serve points.